The fifth season of Longmire finds the stubborn Sheriff Walt Longmire (Robert Taylor) where the fourth left off – with an unknown threat at Walt’s front door. Unsure who the intruder is, we find Walt shot and bleeding on the floor of his Wyoming cabin; his daughter Cady (Cassidy Freeman) weeping over his body and praying for his life. Although Walt recovers quickly from the casualty, he is left with questions surrounding the night of the shooting and sets out to discover who it is that was looking to take his life. 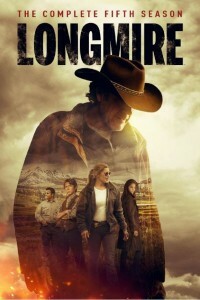 With his best friend, Henry Standing Bear (Lou Diamond Phillips), and Cady now working for his archrival Jacob Nighthorse (recurring guest star A. Martinez), Longmire stands alone in his mission to clean the streets of Absaroka County. All the while, Walt continues to question the idea of a romantic relationship with Victoria “Vic” Moretti (Katee Sackoff) his right-hand deputy. Faced with a wrongful-death civil suit by Barlow Connally’s estate, a confusing love life and new cases weighing down on his team, Walt pushes himself to the edge – putting more pressure on himself than ever to solve Absaroka County’s most-challenging mysteries. His loved ones question whether he can handle the stress – both mentally and physically in the wake of his attack. The question remains… will Walt be able to handle the pressure? Or, could his work be his ultimate downfall?